Durable and built to last, we can provide a range diverse options for your freestanding signs. These fully customised signage options can be engineered to look and operate to meet your specific needs. Our capability allows us to integrate the digital and static elements, delivering a unique and flexible freestanding signage solution. Pylon signs are large freestanding promotional structures, popular within commercial and industrial areas to ensure maximum exposure to passing customers. Due to the durability and the ease of design and construction, pylon signs have become a major component of any business promotion. With their larger-than-life presence, pylon signs attract attention and can be seen across busy highways, motorways and streets, creating a bold statement for your brand. Integrating an LED screen within a pylon sign provides businesses with the full impact of traditional static signage, whilst also providing the flexibility of digital to deliver targeted customer messages. Upgrading an existing pylon sign to integrate an LED allows businesses to change the sign without detracting from the existing sign and branding customers know and recognise. LED technology provides greater dynamic messaging than a standard pylon sign enabling businesses to stand out from competitors and attract passing customers. With custom single or double-sided options available, CV Media & Signage can work with you on the design as well as the engineering to ensure the structural integrity of an existing pylon is maintained. We have deployed these for a range of clients including Murrumba Downs Tavern. A smaller version of the pylon, a monolith is a sturdy and freestanding structure. Unlike the pylon, the poles of a monolith are not visible allowing for a unique design. Completely customisable to your branding, a monolith can be double or single-sided, triangular, 4-sided or bespoke and can incorporate illumination, 3D sign elements and modular components. Monolith’s are often used to deliver a high visibility key site identifier at the front of a site and wayfinding solution. A smaller version of the monolith, a totem is a sturdy and freestanding structure. Like a monolith, the poles of a totem are not visible allowing for a unique design. Completely customisable to your branding, a totem can be double or single-sided, triangular, 4-sided or bespoke and can incorporate illumination, 3D sign elements and modular components. Totems are often used for location recognition within a site, unlike a monolith which is typically used as a key site identifier at the front of a site. The common use of a totem however, is to provide a unique wayfinding solution for sites. Unlike standard wayfinding signage, a totem can be integrated with illumination or LED screens to improve the visitors experience. Billboards demand attention. Renowned for their extraordinary visual impact, billboards can be used for brand awareness, promotions, advertisements and to gain a competitive advantage. Whether you need a temporary or permanent sign, a small or big sign, our manufacturing and design team can tailor the billboard to suit your needs. 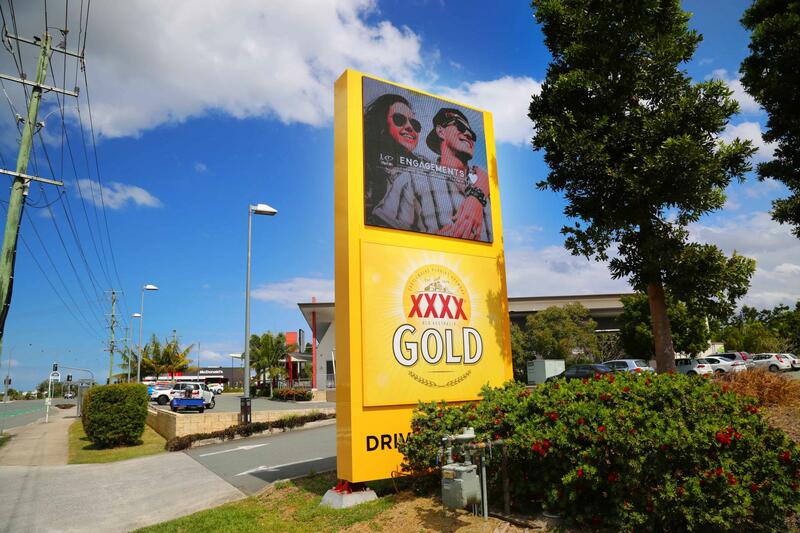 Billboards can be utilised in most areas but are predominantly found along high traffic areas, secondary roads and connecting arterials, railway stations, cafe precincts and suburban commercial areas. CV Media & Signage provide the complete solution including ensuring compliance with local regulations and council approval. With its ability to deliver top quality LED vision along with the option to move internally and externally, our patented Mobile LED Advertising Displays are fully engineered and suitable for a range of changing environments. Australian designed and manufactured, the full colour portrait P6 LED screen can display high resolution static images and video. The screen utilizes the latest in SMD LED technology to ensure bright vivid colours and excellent contrast. These are perfect for store openings, events, promotions, sporting events, sales, safety messages or any situation that requires your message to be seen in the brightest and most vivid way.